About: As the Delaware Valley Region’s only specialty hospital dedicated to treating cardiovascular and lung disease, Deborah Heart and Lung Center (Browns Mills, NJ) treats some of the highest acuity patients in the area. Given the severity of the average patient admitted to Deborah, optimizing patient throughput is vital to the hospital’s success. Challenge: Deborah was searching for a way to provide executives with timely access to current analytics, in order to support their performance improvement efforts. Although they had used Microsoft® Excel to track metrics in the past, this process was time-consuming, and the results were not always easy to interpret. 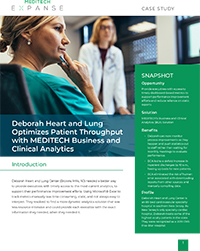 Execution: Deborah leadership implemented MEDITECH’s Business and Clinical Analytics solution to monitor the success of various initiatives and process improvement projects. The rollout of their first two personalized dashboards, the Surgical Intubation Times Dashboard and the 10a.m Discharge Dashboard, gave staff access to the data they needed to make these processes more patient-centric, and to decrease instances of patients waiting unnecessarily. Increased discharges before 10 a.m. sixfold. Identified and addressed root causes for disparities in timeliness between physicians. Backed suggestions for new projects and results of performance improvement projects with solid evidence. Eliminated the risk of human error associated with downloading reports from other sources and manually compiling data.